SEATTLE--(BUSINESS WIRE)--Oct. 18, 2016-- (NASDAQ:AMZN) Amazon today introduced new features to the Prime Photos service in the U.S., designed for Prime members and their family. Prime members can now invite up to five family members or friends to join their Family Vault, which includes access to Prime Photos benefits including unlimited storage of photos, plus an additional 5 GB for videos and other files. With the all-new Family Vault, bringing family photos together is as easy as one-click or swipe from a computer or mobile device. Customers can start using the new features of Prime Photos today at http://www.amazon.com/photos or through Prime Photos mobile apps. Family and friend access to Prime Photos, at no additional cost: To ensure all the great moments and memories are preserved, regardless of who captured them, Prime members can now share their Prime Photos benefit of unlimited photo storage and 5 GB for videos and other files with up to five family members or friends. Simple, private sharing through the Family Vault: Family Vault members can add their favorite photos and videos individually with a click or swipe, or set their account to automatically add all their photos and videos to the Family Vault. Smart search technology: Prime Photos’ new search technology makes finding photos based on people, places, or things a snap. Gone are the days of customers wading through thousands of photos to find a specific image. Looking for pictures from a vacation or wedding? Search for “sunset” or “wedding” and relevant photos will show up. 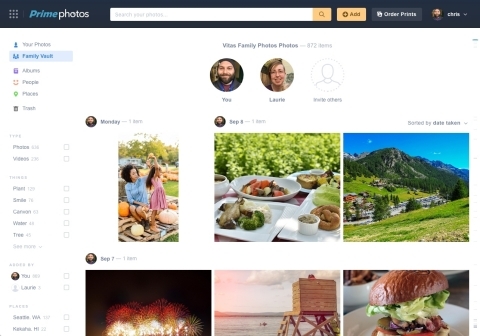 Customers can also browse photos of individual family members and friends in the People view as well as search and filter by location or date. Photo printing with free delivery for Prime Members: Customers can now order photo books, cards, and prints directly on the web from their Prime Photos account. Offering a variety a ways to preserve memories, Amazon Print products start at just nine cents a print, and ships with free delivery for Prime members. Customers can learn more and order prints today by visiting www.amazon.com/printing. Tens of millions of Prime members around the world enjoy the many benefits of Prime. In the U.S., that includes unlimited Free Two-Day Shipping on more than 30 million items across all categories, unlimited Free Same-Day Delivery on more than a million items in 27 metro areas and one and two-hour delivery with Prime Now on tens of thousands of items available in more than 25 metro areas. In addition to fast, free shipping, members have access to unlimited streaming of tens of thousands of movies and TV episodes with Prime Video, more than one million songs and thousands of curated playlists and stations with Prime Music, early access to select Lightning Deals all year long, free secure unlimited photo storage with Prime Photos and one free pre-released book a month with Kindle First. For more information, visit www.amazon.com/prime.